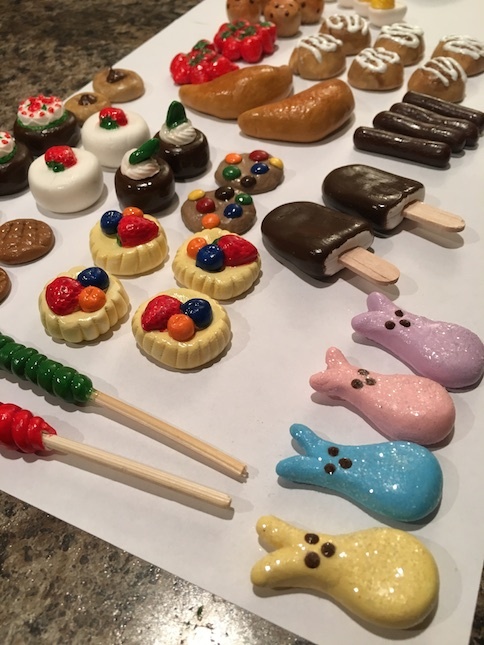 DOLL FOOD SPECIAL – DESSERTS! Hi guys! 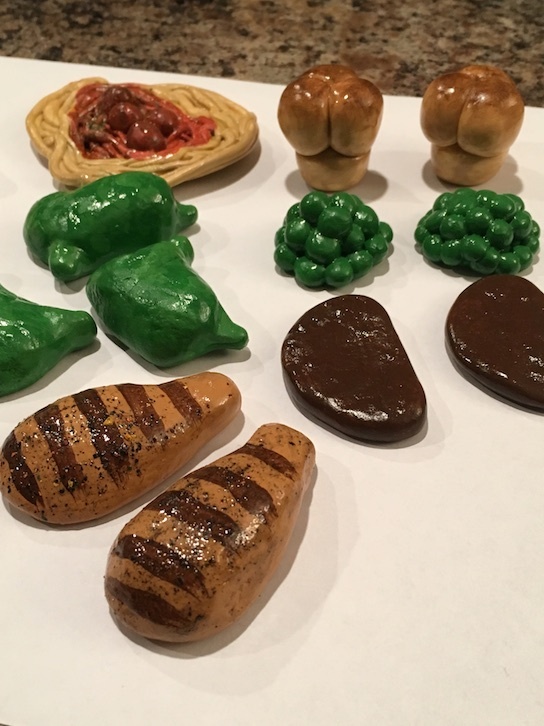 We are back with the last installment of our Model Magic food series! Today we are looking at Desserts! Yum! My favourite! Okay, now let’s move on to Desserts! Enjoy! Up first we have Mini Cakes! This is just to show the size compared to the doll’s hand. 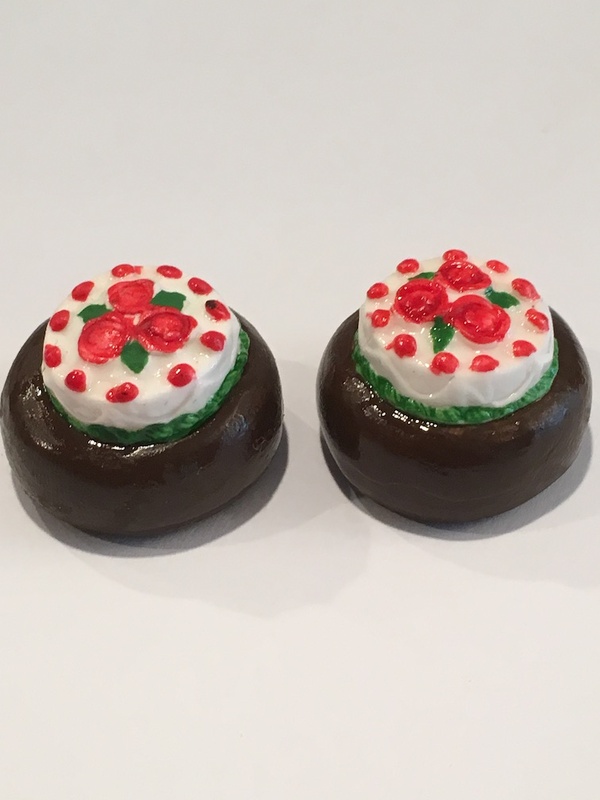 Mini Cakes – For the base, roll a ball. Flatten the ball slightly until you have what resembles a wheel. You can roll the wheel to make it more uniform. Add whatever you like on top. 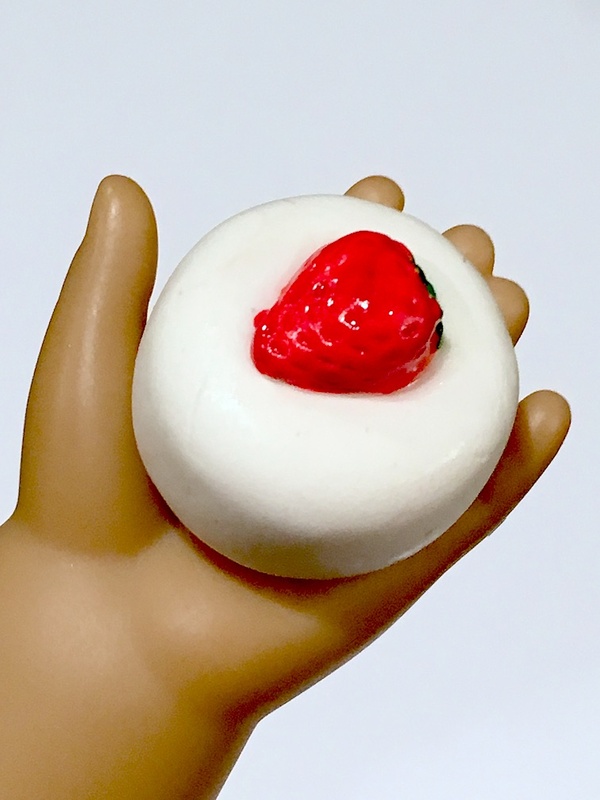 We have a whipped cream clay mold as well as a strawberry mold, so we just played around with whatever looked cute. We also had a little rose cake mold. Once your clay is dry, paint. 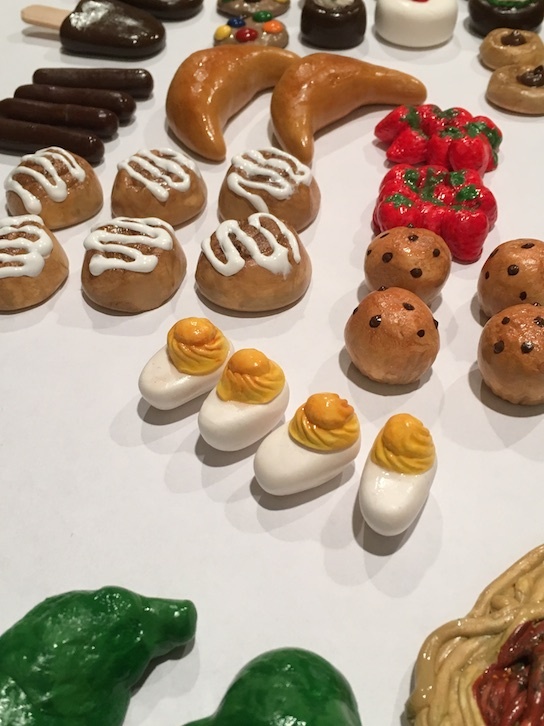 I used brown paint for chocolate, and I just left the clay white for white chocolate. 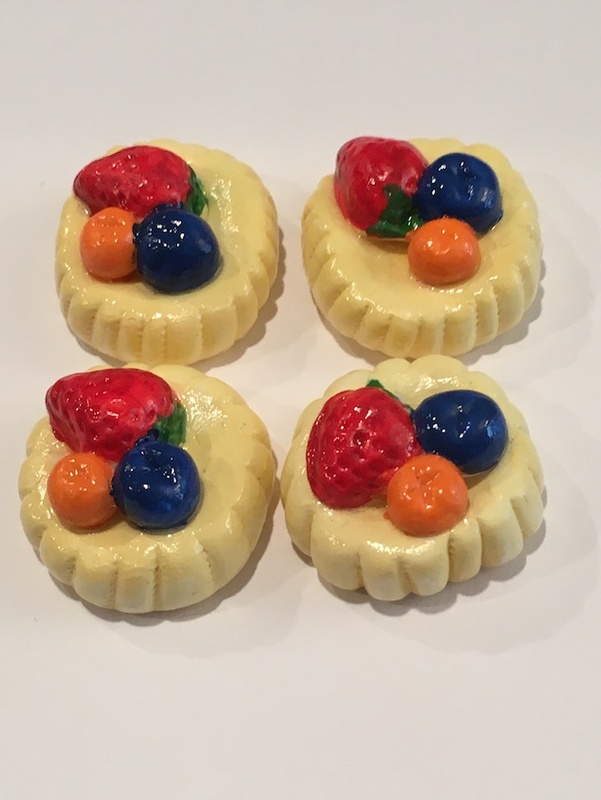 Fruit Tarts – For the base, roll a small ball. Flatten the ball slightly until you have a wheel shape. Roll the wheel to make it more uniform. Using a straight edge, cut lines all the way around the edge of your tart. Next add your fruit on top. 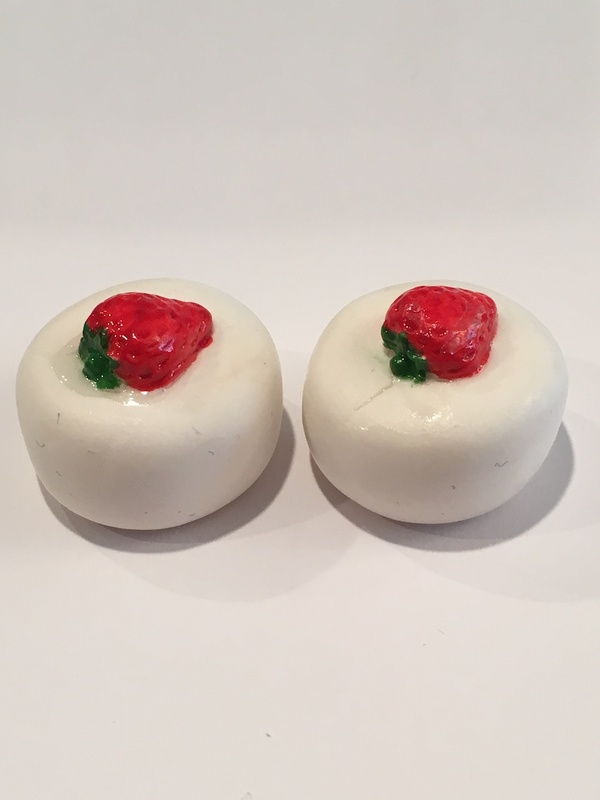 We had a strawberry mold. I just rolled small balls for the blueberry and the orange berry. Then I cut small crosses into the tops of the berries. Once dry, paint the base light yellow. Paint your fruit. Peanut Butter Cookies – Roll a small ball. Flatten into a cookie shape. Use an old toothbrush to create texture on your cookie. Then, using a straight edge, cut a grid into the top. Once dry, paint a light peanut butter brown colour. 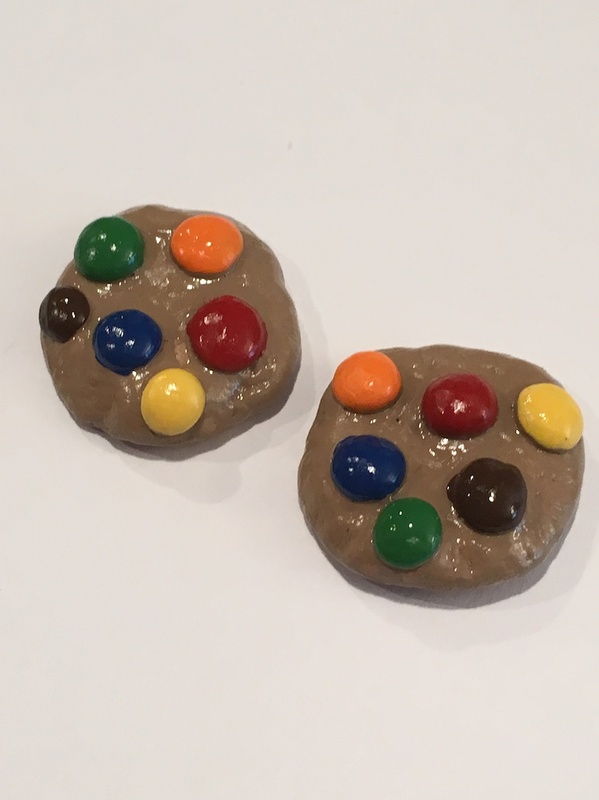 M&M Cookies/Monster Cookies – Roll a small ball. Flatten it into a cookie shape. Use an old toothbrush to add texture to your cookie. Roll tiny balls. Stick the tiny balls on top of your cookie. Once dry, paint the entire thing in a cookie brown. Let it dry. Using green, yellow, orange, blue, red and brown, paint your M&M’s. I just blobbed a thick layer of paint on each one to give them a candy coated look. Varnish your cookies. 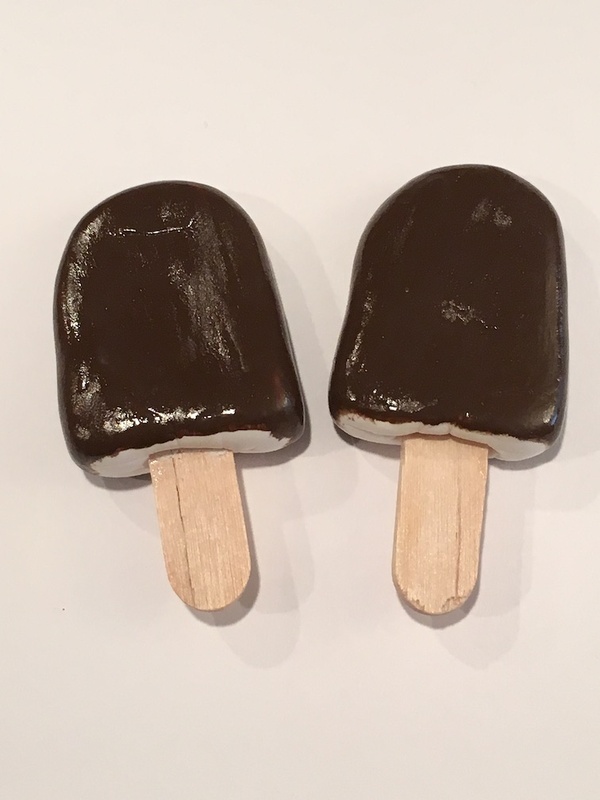 Fudgesicle – For these I just had to play around to get the right shape and size. Once you are happy with the top part, take a mini craft stick, and cut it down to size. Next, press the craft stick end into the bottom of the fudgesicle a little ways to create a dent. Remove the craft stick. Once the clay is dry, paint it. You can do brown for fudgesicles, orange for creamsicles, pink for pink creamsicles etc. Be sure to leave the bottom white where the ice cream shows. Hot glue the craft stick into the dent that you made in the bottom of your fudgesicle. 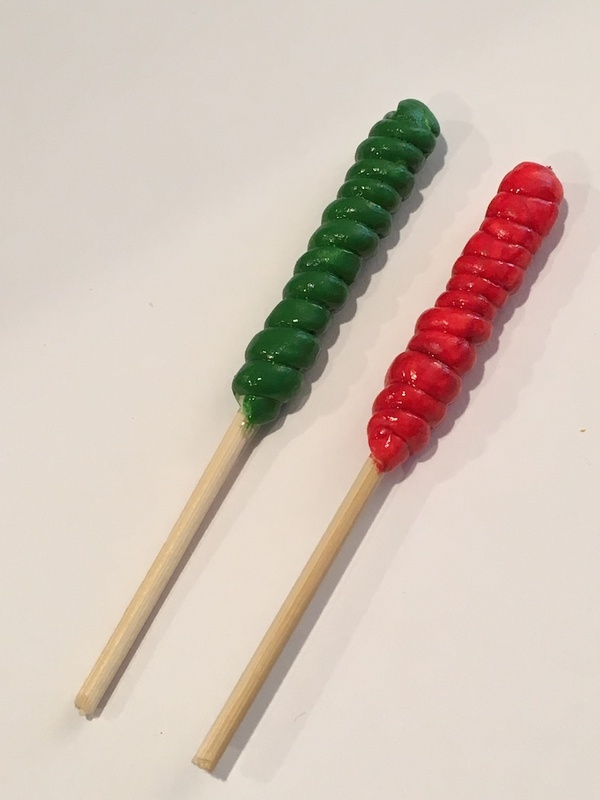 Swirl Lollipop – The Little Miss made these all by herself! 🙂 Roll a long snake. Wrap it in a spiral around a piece of thin dowel. Once dry, paint it any colour you like. 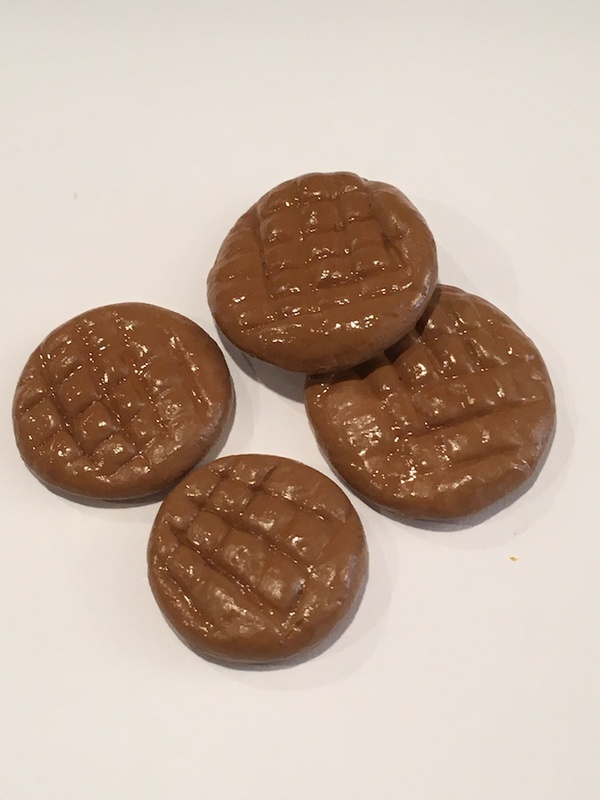 Chocolate Drop Cookies – The Little Miss made these cookies all by herself too! 🙂 Roll a small ball. Flatten the ball into a wheel. 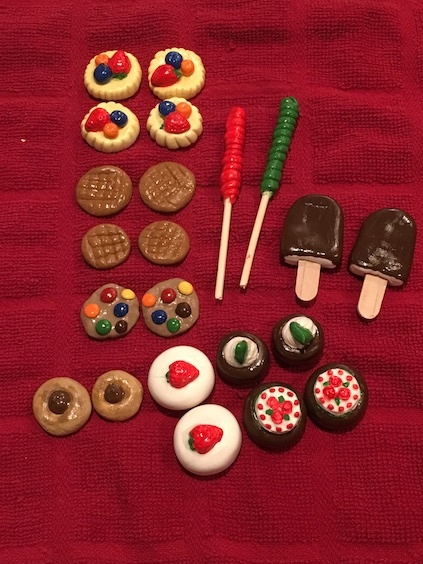 Using an old toothbrush, create texture on top of your cookie. Using the end of the toothbrush handle, poke a dent in the centre of your cookie. Once dry, paint the cookie brown. Use brown chalk to add browning to the top. 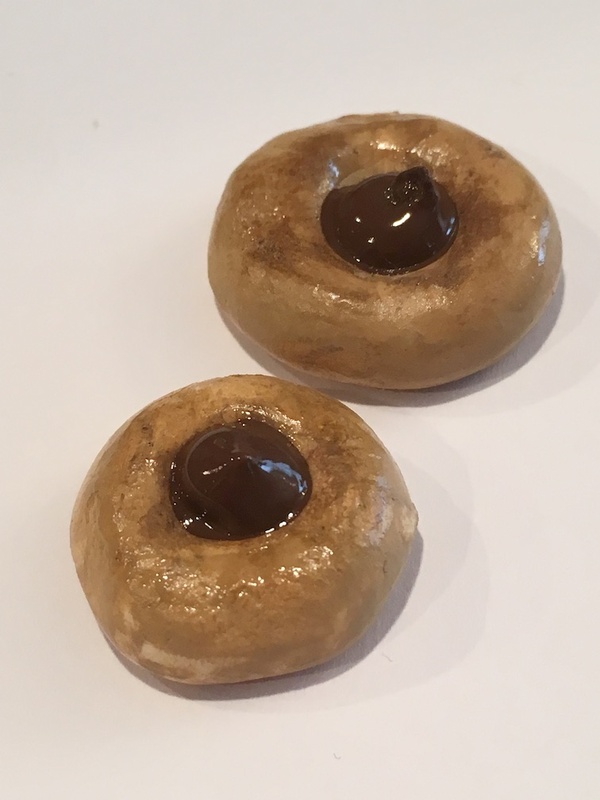 Fill the cookie centre with a brown puffy paint chocolate chip. I know, it’s nowhere close to Easter, but I wanted to try these out anyway. They turned out so cute! 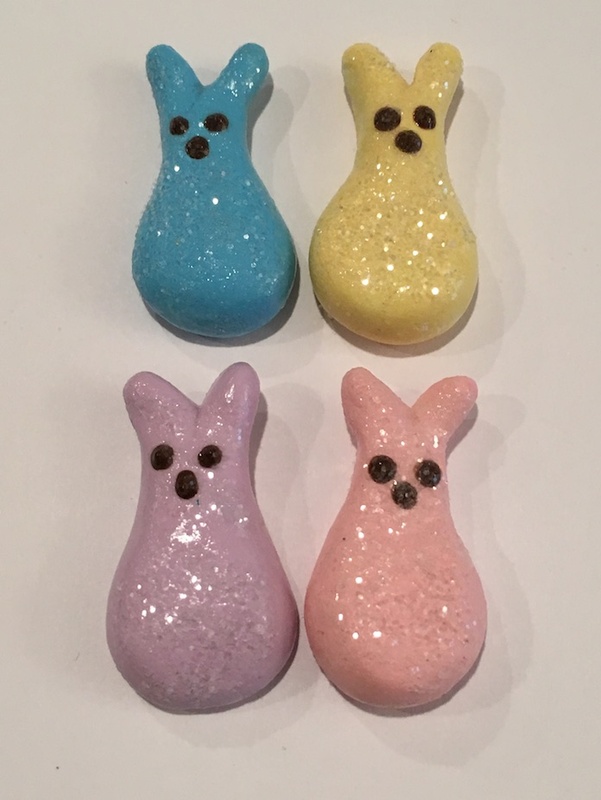 Easter Bunny Peeps – Roll a small ball. Create a teardrop shape. Flatten the teardrop. Use a straight edge to cut two ears at the top of the bunny. Round out the edges of the ears. Once dry, paint pastel colours. Use brown paint to add eyes and a nose. Varnish. Before the varnish dries, sprinkle white glitter on top. I hope you enjoyed all of our Model Magic fun! If you missed it, find the other two segments here. 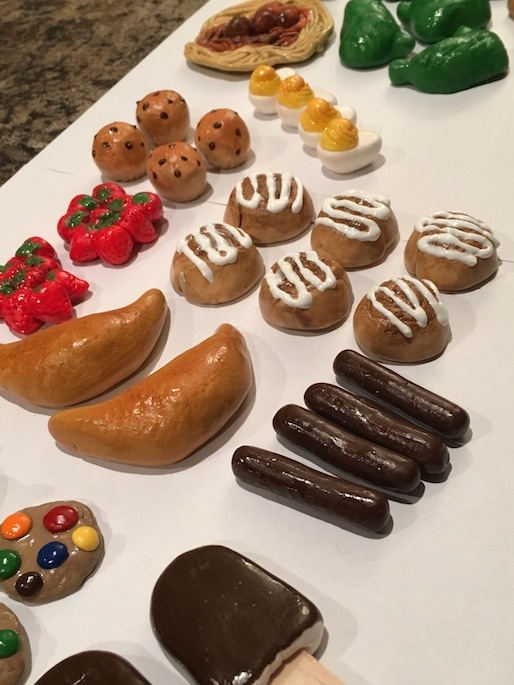 Here are some shots of all of the food we made! Next > WE ARE BACK! Very nice! I especially like your fruit tarts! It all looks wonderful! You did a great job! My Lanie and Lea want to come over and try all your food! It looks so good. YUM! 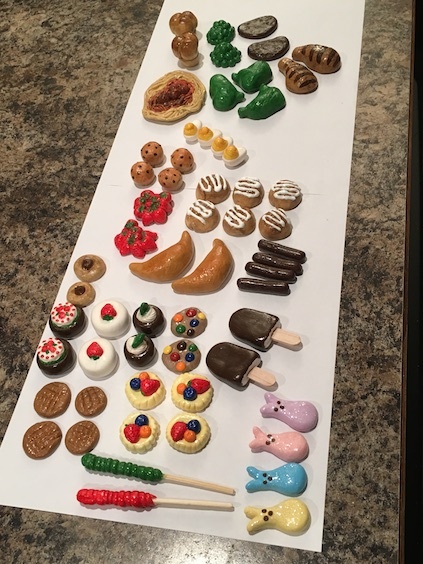 All those desserts look delicious! 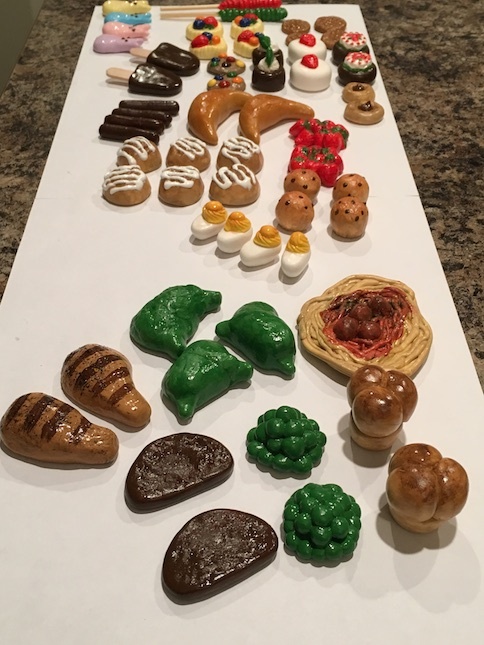 You did an incredible job on each piece of doll food – everything looks amazing!